Mirror Mirror Blu-ray Review. I really wanted to like Mirror, Mirror. I am such a fan of the original Disney classic and I was interested in seeing someone else’s perspective of the beloved tale. However, Mirror, Mirror is just too whacky and uneven for its own good, and the frequent plot holes and extremely painful ending don’t help the already poor story. 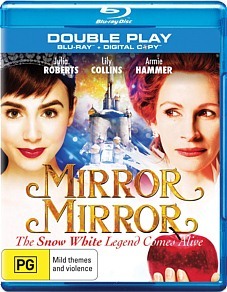 Directed by Tarsem Singh, Mirror, Mirror offers viewers a different spin on the Grimm Brothers’ classic Snow White by giving Snow’s evil stepmother the spotlight. Starring Julia Roberts as the evil Queen Clementianna, this film’s interesting premise is squandered by a poor (and sometimes stupid) script, bizarre set and costume designs and an extremely obnoxious attitude throughout. While there has been a plethora of fairly average Snow White adaptations released this year, Mirror, Mirror would have to be close to being the worst of them. Queen Clementianna is having a ball running the kingdom her late husband the King (Sean Bean) left for her. Hosting lavish parties, playing chess with humans and being extremely cruel to her daughter-in-law Snow White (Lily Collins). As Mirror, Mirror is supposedly told from the Queen’s perspective, the opening moments of the film are presented in an exceedingly pretentious tone, causing Robert’s portrayal of Clementianna very unlikeable, which I found rather odd for a film which desperately wants audiences to like her. After the opening half-an-hour or so, Mirror, Mirror throws its interesting perspective idea right out the window, and instead focuses on the character of Snow White, and how she deals with having to keep incognito after her supposed death. From here on the film follows the typical story that Snow White fans have grown to love, although it attempts to butcher it as much as possible in the process. Characters are all over the place, some comical and some serious; I found it hard to decide what tone the film was going for. Collins as Snow White is quite charming to watch however, being one of the only tolerable characters other than the seven dwarves, who were rather funny in some scenes of the film due to the great chemistry between them. It was very obvious that the actors were performing on sets in Mirror, Mirror, due to a poor choice of camera angles that fail to fully immerse one in the scenery; one scene in particular early on in the film (when we first meet Prince Alcott) is rather poorly done. Another thing I found poorly done was the costume design. I understand that the film has a quirky vibe going for it, but some of the outfits the actors are forced to wear are so bad it’s embarrassing. Special Features include a run-of-the-mill making of feature, trailers and deleted scenes. There’s nothing special about them, however. I really wanted to like Mirror, Mirror. I am such a fan of the original Disney classic and I was interested in seeing someone else’s perspective of the beloved tale. However, Mirror, Mirror is just too whacky and uneven for its own good, and the frequent plot holes and extremely painful ending don’t help the already poor story. If you, like the Queen, are on the hunt for the fairest one of all, look elsewhere.